Best prices, $325. Great fishing! We fish where you want to fish. Myrtle Beach inshore fishing charters to offshore fishing charters North Myrtle Beach, SC. My private Myrtle Beach fishing charters offer you great fishing trips in and the most memorable & safe family fishing experience in the Myrtle Beach area. 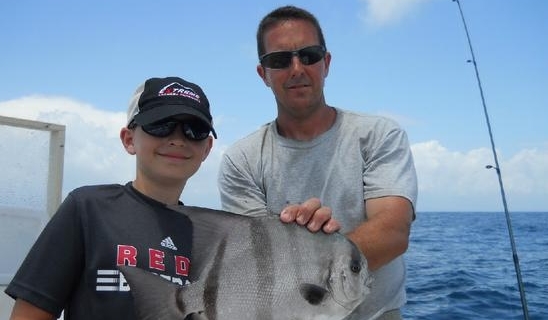 Groups with kids will especially enjoy our fishing trips. Your kids can get a hands on experience catching and handling crab, shrimp and a large variety of fish. Often times dolphin are seen while charter fishing in Myrtle Beach, North Myrtle Beach and Calabash NC. Check out our Myrtle Beach charter fishing videos click here! Book early because our Myrtle Beach fishing charters fill up quickly in season. We are the affordable Myrtle Beach family fishing charters & family fishing charters in North Myrtle Beach, shrimp trawling, crabbing and Myrtle Beach boat eco tours available. Kids 12 and under fish free. Please call to talk about an affordable price to get you your family and friends out fishing with Captain Ryan’s fishing charter in myrtle beach. I offer the best prices for private Myrtle Beach fishing charters in the area. See Boats and Prices page for more info. Owner Operated. Pay less and get more with Captain Ryan! I provide free fish cleaning. Please check out my Myrtle Beach Fishing Charters tripadvisor and facebook reviews. Great Captain, Great Experience!! We have been fishing for the past nine years with Captain Ryan. He always seems to know just where the fish are and what baits they are looking for. Fun for the whole family — You will NOT be disappointed with Werner Ocean Adventures LLC! !